Japanese Works of Art Auction – Part I: Japanese prints and Decorative arts, Quinn’s Auction Galleries, April 24th, 2019, at our Falls Church location. Japanese Works of Art Auction – Part II: Netsuke and Okimono, Quinn’s Auction Galleries, May 2019, at our Falls Church location. 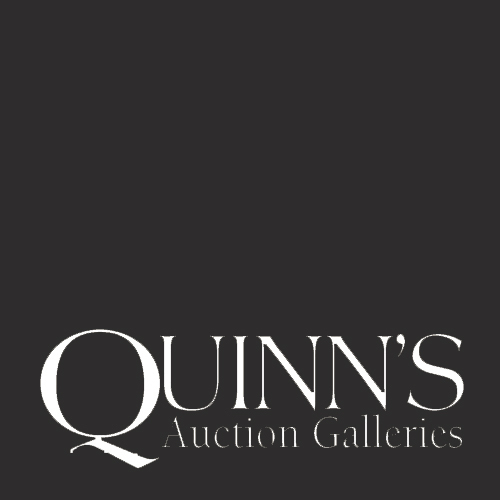 Judaica Auction, Quinn’s Auction Galleries, May 2, 2019, 6:00PM at our Falls Church location. Chinese Snuff Bottle Auction, Quinn’s Auction Galleries, Upcoming this May at our Falls Church location. A George Washington and Thomas Jefferson Signed Document from 1793, sold for $23,000 on February 28, 2019 in our Presidential & Americana Auction. A pair of 16.10 Ctw. diamond clip earrings, sold for $19,050 on December 5, 2018 at our Falls Church location. The Tiffany Studios Arrowroot lampshade and lamp, sold for $28,800 on June 9th, 2018 at our Falls Church location. The Mitsui Shop at Suruga-cho in Edo by Hokusai, from the series Thirty-six Views of Mount Fuji, sold for $21,000 on June 3rd, 2017 at our Falls Church location. “Laguna New Mexico,” watercolor by Thomas Moran, sold for $11,000 on June 3rd, 2017 at our Falls Church location. Chinese blue and white dragon porcelain box, Jiajing mark, sold for $42,500 on June 3rd, 2017 at our Falls Church location. Letter signed by Joseph Brant, Revolutionary War May 31, 1776, sold for $4,750 on June 1st, 2017 at Waverly Rare Books and Prints. Tiffany & Co. sterling and enamel cigarette box, c.1915, sold for $75,000 on Saturday, March 25, 2017 in Central VA.
“Moonlight on the Marsh” by Granville Redmond sold for $32,400 on January 28, 2017 at our Falls Church location. 1960 Gibson Les Paul Sunburst guitar sold for $165,200 on September 13, 2014 at our Falls Church location. Weekly Treasure Auctions: Falls Church on Wednesdays at 6pm; Central Virginia on Tuesdays at 3pm. Circa 1928 diamond and platinum Art Deco bracelet sold for $22,800 on September 12, 2015 at our Falls Church location. Pair of 17th/18th century Huanghuali fangdeng stools (sold for $448,400) & a Zitan kangzhou table (sold for $247,800) on April 18, 2015 at our Central Virginia location.